The days here are getting bleak. It’s cold inside and out, the pollution is building, and finals are still two weeks away. Not only that, but the important tests have already arrived. Standardized tests might not be as important as they once were, but the GaoKao college entrance examination is still the only criteria used for college admissions. After graduating, most of my students will return to their homes to teach primary school, but they still have 7 full-day standardized tests that they must pass before they receive their associates’ degrees, and more if they want to have any chance of moving on to get their bachelor’s degree. All this to say: We’re firmly into the time of dead eyes and quiet classrooms. Volunteers do not come easily. Teachers’ awkward silence thresholds are raised, and the tick marks next to names pile up like the snow not yet here. One of the things I’ve struggled with most as a teacher is how to deal with cheating. When I started the semester, I made it clear that everyone should do their own work and not copy from other sources. On the first assignment, about 1/3 of the assignments were copied word-for-word from the internet or other students. Since then, I’ve more effectively gotten the message across, but there’s still one question left in my mind: What do you do when a student insists that they didn’t cheat? During a dictation last week, I took a student’s paper away for turning to discuss her answers with others. She came to talk to me afterward, telling me that she turned only because she was asked for help, that this dictation was easy for her, and that she didn’t cheat at all. Talking later, she expressed frustration with (I think) a tinge of hurt that I didn’t seem to believe her. Part of this, I now understand, comes from not understanding the difference in connotation between cheating on an assignment that I gave her and cheating me. She thought that I was taking it personally. She was right, though, to a certain extent. I didn’t believe her, right away. I simply didn’t have any reason to, and I felt I had to be consistent with the rules that I set forth. Dead-eye time of the semester is one of those things that transcends borders. It is simply what we do when we’re tired and we know there’s sand left to fall. But dead eyes are not dead people, and the life does shine through the fog. 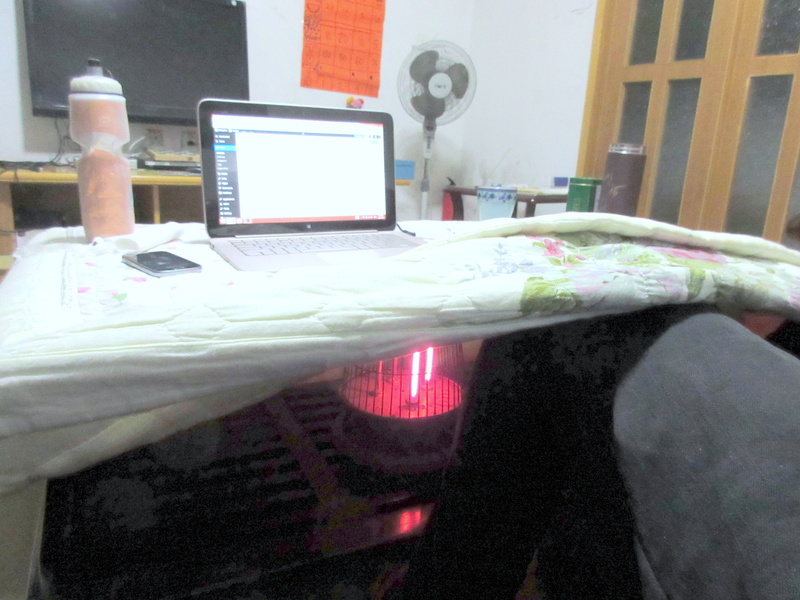 When people come over for movie night and warm up by the table-heater-blanket apparatus that seems to be the only thing keeping everyone’s legs from freezing, it’s then that the fog starts burning away. The edges of the eyes relax a bit, and that’s when you realize you forgot to keep your eyes soft. I always forget to keep my eyes soft. My students turn in a wide variety of work to me, but there are some special pieces of work that interrupt my grading process and make me sit for a second. This one has the air of legend to it, and although some of the prose seems borrowed, I couldn’t find a source, couldn’t fault them, and thus, was happy. All errors [sic], that I know of. “Once, mary and her younger sister, whose name is Helen, were very famous. The reson was that they had magic. They lived in an old house which lay in china, it nears the Pacific Ocean. There was a beautiful garden in front of the house. There were various flowers and grass, butterflies were flying around the garden. They always practice magic in the garden. Though they were twins, they were completely different. They hardly said anything to each other. Mary was a vulnerable girl and lacked in confidence. Helen was a snobbish person and curious about everything that she didn’t know.